R.I.F.T. Airsoft offers yearly Membership for £25. But why would you want to become a member? We love Airsoft in all its glory - from the Lone Soldier to the Elite Squad! Every Member will be presented with a Membership Shield that has a unique 3 digit number. The R.I.F.T. Airsoft Membership Shield symbolises a unity of players who appreciated what we stand for; Sportsmanship, Friendship & Honesty. R.I.F.T. 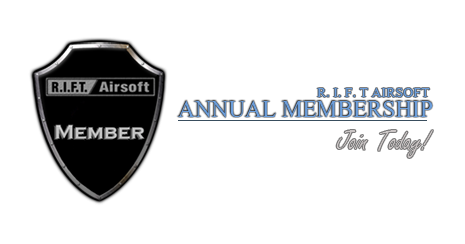 Airsoft is proud to say that over 1060 Membership Shields have been presented to date! Meet new players - trade, receive discounts on Ammunition, chat and most importantly, meet on the Battlefield! Membership is optional and costs £25 a year. You do not have to purchase Membership to play at any R.I.F.T. Site! 3000 rounds of .20g BB's £6! Ammo is reasonable anyway but as a R.I.F.T. Airsoft Member you will only pay £6 for 3000 rounds of quality Blaster .20g BB's! 3000 rounds of .25g BB's £8! Ammo is reasonable anyway but as a R.I.F.T. Airsoft Member you will only pay £8 for 3000 rounds of quality Blaster .25g BB's! High quality Arm Shield with Metallic Thread. Velcro backing attached so it can be added to any form of clothing! Comes with a unique lifetime membership number! Play 3 games in a space of more than 2 months and R.I.F.T. Airsoft can register you with the UKARA Database allowing you to buy Realistic Imitation Firearm(s). We guarantee your UKARA Number will match your Membership Number. Private forum area for members only. Priority booking for R.I.F.T Special Events! You will be first on the list for any Special Game Events! Special Discounts with Pro Airsoft Supplies! Receive 10% Discount on many Products from Pro Airsoft Supplies! Receive 10% Discount on Products from Combat-UK Stevenage! Membership Fees are fixed and non-refundable. The applicant may renew their membership if they wish to do so at the end of the 12 months. Membership Discounts apply to all Active Members at ANY R.I.F.T. Airsoft Site. All Members details will be held securely and will not be shared with any third party. All Members Shields are unique with the users membership number. This Number will remain with you for life! Members that are not local to the South East of England and do not attend R.I.F.T. events can still take advantage of our discounts and special offers (subject to terms) please contact info@riftairsoft.com for more details before committing to Membership. Minimum of 10% discount is taken from standard retail price, subject to availability from our trade suppliers. Simply contact us with your requirements! You will need to create a Username BEFORE you can Purchase Membership Online. Simply click "Register" (Top Right) and go through the Registration Process. Once We have approved your Registration you can then Purchase Membership! Please Note: When You click the PayPal Image it says "Available Subscriptions" - there is NO automatic renewal after 12 Months! You will be reminded in 12 Months to RENEW if you would like too! Sign up for Paypal here, It's safer, it's faster and it's everywhere. Use PayPal to shop at thousands of web-sites, knowing that your financial details are never shared. We also accept: Cash at any R.I.F.T Event.